OK, so why is this an ALMOST custom painting? The subject is one that a customer ordered at a specific size. No problem, she wanted an 11 x 14 inch painting of a ruby-throated hummingbird visiting some hibiscus flowers. I am happy with how it turned out. So what happened? The problem started when we lost power here about 12 days ago due to a freak snowstorm in late October. Snowstorms don't normally cause long power outages in New England, but this one was heavy and deep and most of the oak trees had not yet lost their leaves. So the trees broke from the weight of the snow on their leaves. Those big old oaks fell helter skelter all over the power lines all over the state. A huge mess. We were without power for 10 days. During this time, I worked on some custom paintings and this was one of them. With no way to access my emails for a while, I did not get the message that the painting was 14 inches tall by 11 inches wide. So I painted it 11 inches tall by 14 inches wide. Won't work. I only took 2 pictures while working on it. This first one shows the pencil drawing. I did not work out the composition on a separate paper for this but just drew right on the watercolor paper. I felt very confident of what I wanted to do so there was not the problem of erasures messing up the paper surface. You can click the images to see them larger. 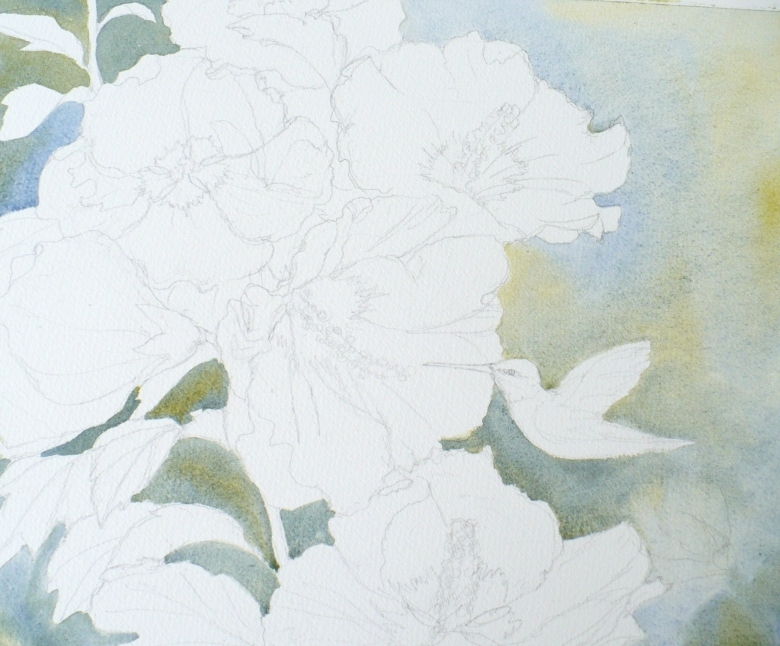 I wet the background and washed in some pale colors. What is interesting is the speckled aspect of the background. Could it be because I'd soaked the paper in water from our brook (since well water was scarce during the outage)? At any rate, I like the effect! 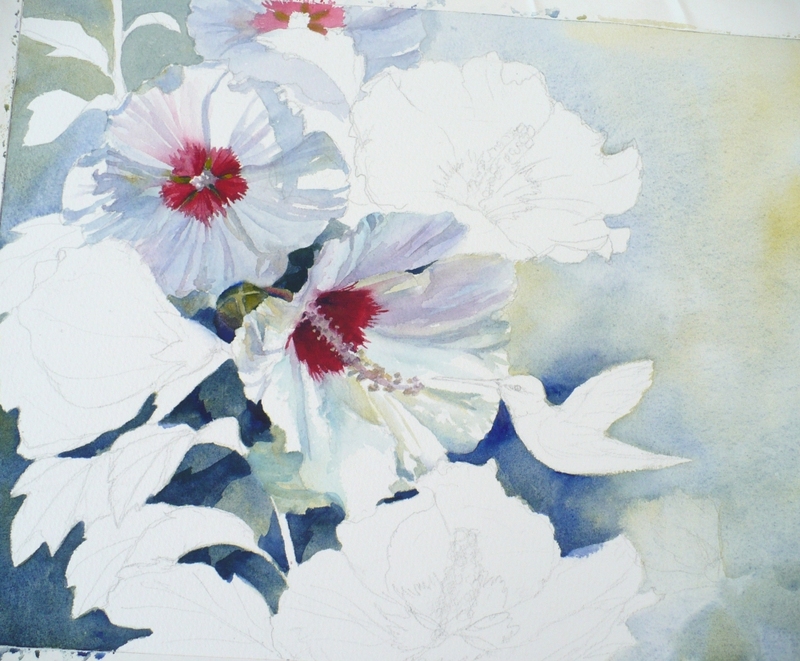 Next, I started on the hibiscus flowers. I love painting white flowers - there are so many colors that can be used in the shadows. If you look closely, you'll see blues, reds, yellows, violets, turquoise. The deep magenta centers of these flowers really make them pop! Last I painted the leaves and the hummingbird. Update: the painting is now sold! Please contact me if you'd like a print or custom painting done. This flowers are very fresh. Beautiful colours used to make them so white. Great job! 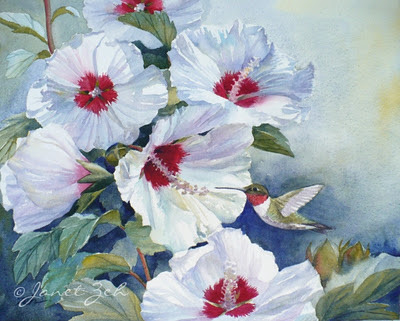 Love all painting.Love the way you painted this.Beautiful colours used to make them.Thanks sharing..